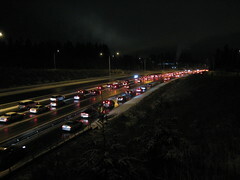 SR520 East @ 51st St. I'm trying to figure out how to link to Flickr photos for the http://blawer.com blog. I think we need a new breed of RSS feed readers. I tend to blog about all sorts of subjects, and I read many different blogs on many different subjects, and I think we have some real challenges in navigating the new news-space. There are a number of things that could be done to improve the blogosphere from a technical perspective, and one of them, I think, would be to start being more deliberate in classifying and tagging articles. Services such as del.icio.us, Digg, Google News, etc. do a great job of harvesting community tagging and automatically processing content. I think deliberately classifying posts in major categories, much like the various sections of print newspapers, would make blogs more interesting to the readership. For example, most of my posts fall roughly into groups such as "gadgets," "ideas/thoughts/musings," "interesting links," and "project proposals." Readers probably each care only about a definite subset of those topics. I also post to multiple blogs, but that's really technically pointless. For example, the Blawker blog could just be a tag or category on posts on my main blog, which could then be automatically aggregated into the Blawker blog, or any other set of blogs. And, the aggregation should be a trivial step, requiring no manual steps whatsoever. At Exbiblio, for example, we each have a blog, and each process in the company has its own blog. It would be easy to cross-post to multiple virtual blogs as well as ensure that each person has his or her own voice by simply aggregating posts based on category and tag criteria. As a blog reader, I would also like to, at different times, read posts on different topics, without having to do tag or keyword searches, analogous to the reading of print newspapers. I think I'd prefer this to scanning the headlines from all the various RSS feeds I follow. As an aside, the "topics" don't necessarily need to be coherent topics in the traditional sense, but could be something more like "channel 765," a channel assembled by a person or a group of people, which has a high correlation with the sort of articles that I choose to read when in a certain mood. I also think blogging would benefit from a set of standard schemas, e.g. for media reviews, recipes, business plans, items for sale, profiles, PayPal account, personals, etc. My Lil' Reminder is a very cheap voice recorder (2 for $10) being sold heavily on TV now. I think this article by Joel Spolsky is an excellent example of the sort of thinking it will take to make computers accessible by everyone. This was Apple's aim back in the 80's, but we've gotten a bit lost along the way. There are a number of technologies that I seem to be a perpetual early adopter of, but they don't quite work. Voice recorders is one (and I'm working on one that I think I'll use). Another major one is todo lists. I use todo lists in software source code, in iCal, in OmniOutliner, in text editors, in my email drafts folder, in email sent to myself (and my inbox in general), etc. Still, the only todos that actually work for me are the ones that I inject into the workflow of my life, somewhat analogous to the method of loci approach to memorizing. E.g., I put a note on the door that I'll be exiting in the morning to remind myself of critical things to take to work; I open up an email and leave it on the screen if it needs to be addressed when I next open up my laptop; I rearrange objects so that they'll naturally be there when I need them, such as keys, sunglasses, cell phones; I'm a firm believer in having a designated location for each object, so that I in the worst case only need to search one box, for example. It may be that I'll someday adopt a device that I'll always have with me, that can sync up with anything I do on computers. Cellphone PDAs can do this, although they could use better UI for todos. In the meantime, I think what I'd really use is a todo list that supports both priorities and tagging (or classification), and is able to alert me of todos based on the tags and priorities, rather than dates and times for each todo. Let me explain why, and what I mean. What I mean is that I'd like to be able to trivially mark a todo as a "don't leave for the office without it" item, or a "do this before going to bed" item, or a "remind me every day or so, but make sure I get back to it in 1-4 weeks" item, etc. There aren't many categories like that that matter to me, but I'd like the computer to understand them well, including being able to trivially take hints about my level of tolerance for distraction, or figure out that there's a build-up of small tasks that will need a solid block of time to get done, and possibly go into things like understanding which items require access to help desks, in what time zone, etc. I'd like to be able to have a dashboard of different types of tasks, and be presented with concise lists of immediate actions at the appropriate times, such as "whenever I turn on my computer in the morning," or "before I'm likely to leave work, taking into account whether I've been at my desk most of the time during the day, or the computer has been largely idle, which is a sign of meetings, and means I may abruptly turn off the computer and head out." Setting a date and a time for a todo item maps very poorly to the problem. It was appropriate for pen-and-paper systems in the last century, but it's not appropriate to modern computing systems. I think it's analogous to the problems with naming a computer file when you create it: 1) you don't have the context to make that decision at the time you create the item or file, and 2) the action isn't a highly creative task requiring such an open-ended solution, but is rather quite constrained to follow a few simple patterns, such as "morning task" or "evening task," or "my work started on day x on subject y, and I'm not quite sure what y is yet, and I'll use search to find it anyway." Exbiblio and its other half, Compendia, sponsored tables at the Conservation International event at the Seattle Center little over a week ago, and it was a very special night. We got to meet with people working for CI, and listen to Thomas Friedman present a very compelling case that we'll need alternative fuel sources very badly, both to enable China, India and other quickly modernizing countries to have the sort of comforts that we enjoy, and in order to democratize the Middle East. The Register is reporting that Motorola is buying Good Technology. This could be a huge deal for mobile productivity applications. Good has a really nice user experience for Personal Information Management applications, and the Motorola Q is a very nice device. Together, they should make a very compelling alternative to the Blackberry and the Sidekick. I hope this also means that Good will have the resources to produce software for those of us who don't use Microsoft Exchange servers. There are a number of ways in which I think Web browsing could be made better and more pleasant. One of those ways lies in the handling of images. I've come across two tools for the Mac that do a great job of at least presenting images for viewing. Envision lets you specify a URL and crawling parameters, and it will pull down the images to your computer, and give you a slideshow. It's a great way to watch paintings from online museums, or astro-photography, for example. PicLens integrates with Safari, and lets you click on images on certain sites, and get an instantaneous picture browser, and slideshow. It's a great way to show kids animals or go sight-seeing. Go to Flickr, or Google, for example, and type in "pyramids mexico" or "malamutes" or what-have-you, and click the little PicLens icon. Works like a charm. In one of his books, Tog mentioned a UI that would shift during the day to emulate the feel of the time progressing outside in the real world. Is there a site out there that collects problems and desired use cases? I've wondered repeatedly over the years if there wouldn't be a huge value to having a site that collects problems and use cases. You see, in my experience, having clearly articulated a question is almost having an answer, and most difficult questions are so because we haven't really nailed the question yet. So, what I propose is a Yahoo-like directory, using categorization, tagging, comments, cross-linking, etc., to capture what we perceive to be problems awaiting solutions—and solutions awaiting problems (yes, these are abundant and valuable as well). It seems that the Internet is already giving rise to solutions in this direction, such as the recent My Dream App contest. But, I have yet to see it done in a systematic fashion. I think it would be a great adjunct to a service like the one my wife is starting up to help startups start up, Startup Cents. A directory of problems and solutions would seem like a great water cooler for inventors and entrepreneurs to gather around. Ever wonder how widespread these waves of colds, flues, etc. are? Having recently had kids in daycare, and, working in an office, I've repeatedly, as I believe most people have, witnessed diseases that come in waves. Now, I wonder, for one thing, what this means for the first-tier medical profession. Could they actually diagnose illnesses with 99.9% accuracy over the phone or Internet, because they already know that bugs A, B, C and D are at various points of activity in the area? Is there greater variation that that? The reason to take a child to a doctor is usually not to find out whether they have X, Y or Z virus, but to find out whether it has caused a bacterial infection, which is sufficiently bad to warrant antibiotics, or to find out if something else is going on. Perhaps it's only a desire for what WIRED magazine calls "infoporn," but I think it would be cool to be able to have community-, or nation-, or world-wide visibility into the spread of illnesses, and what better way to do it that as a distributed, online community? I imagine governments already do this sort of thing, but visibility to the public is, as far as I know, very poor, and it would raise privacy concerns if all doctors report all illnesses to some entity. So, what I'm thinking of is a place where you register, with rough home, office, school and daycare locations, somewhat anonymously, but to make it easy to not have to repeat location information for illnesses, and can feed in any non-sensitive information about illnesses you witness. I imagine questionnaires would be developed over time to make the data more aggregatable. What good would it do? I'm not sure. Maybe you could know better when to telecommute, or start taking vitamins. Maybe new patterns would be seen that could be used to prevent the spread, since more people would have access to such data. It struck me, though, that parents could really use targeted, educational T-shirts (EduTs). I think I efficiently, and with little effort, learned to read and count early in my toddler years by watching Sesame Street and Five Ants are More than Four Elephants, and as a consequence, I've concluded that in-life learning experiences (by which I mean experiences that aren't really intended to be "an education" but just blend education into more regular experiences) are a great way for people who want to learn to learn. Since kids spend a large part of their time looking at, observing, and emulating their parents, why not put some extra educational value onto their clothes, rather than largely inexplicable "abc's" as my daughter calls them, and other cryptic imagery. I imagine you could put compact stories into single pictures, or cartoon-like sequences, or you could have interesting situations that would be food for discussion on topics that toddlers care about and could learn from. At the frivolous end, you could have my favorite submission for the all-time shortest story with a plot, suspense and other sophisticated literary attributes: "The elephant sat on the flea." ;-) Or, you could have the regular "A is for apple" or "barber, baby, bubbles and a bumble-bee" stuff. 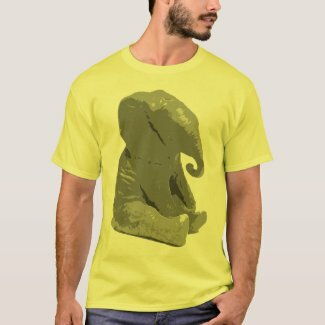 Many children's books are short enough anyway to only cover 4-10 pages, so why not put them on a T-shirt. Hikipedia sounds like it's about teen relationships, but it's really a Wiki for hiking trails. I should put the trails up to my house on there. Thanks to Justin for the link. I heard about an interesting site called RateMyTeachers.com, while listening to The World Is Flat by Thomas Friedman, whom I'll be listening to live tomorrow evening. Sounds like an excellent resource for picking a school for my kids. Have you ever seen a weird light in the sky that you couldn't explain? Did you ever wonder why a particular traffic route was congested at a certain time? Well, it happens to me quite frequently, and I don't want to slow down traffic even further by actually gawking, so I've sometimes searched the local media for reports. Sometimes you can get information there, such as when a gas semi knifed and ignited by the Issaquah off-ramp; but mostly, I draw a blank. If it's a big enough event, it may appear in the media. For example, my wife and I saw an amazing light in the Utah desert a few years ago, and could only guess what it could be, but we couldn't explain it. It started out looking like maybe it was a helicopter pointing its lights at us, but it quickly grew too bright, and was clearly too far away. Then, it started trailing away toward the horizon, almost like a contrail, but much brighter and faster. It was quite a sight. Later that week, we saw a photo of it in the newspaper. It was some test missile or other, shot into the Pacific. But, sometimes it's a much smaller event, such as the light over Kirkland on the evening of Sept. 29th, 2006, that looked like a helicopter crashing or something, that wouldn't have been seen by more than maybe a few thousand people, at most, and of them, there are probably only a handful people who would use a community news service like I'm proposing, as authors. It should be really easy for locals to upload such information, and for other locals to search it. Yet, I haven't found such a service on the web. Local media is too selective (who's going to care about some little mud slide on Issaquah-Hobart in a few days—OK, bad example—that one was in the news for weeks, but...), and blogging is too scattered. Technically, an open-for-all locality-based blog and/or Wiki would do it, but I haven't been able to find such a beast. For it to work, it would need to be well-known enough that people would actually go there and post questions and answers. I'll do some more searching, but if I don't find one, I think I'll start a blawker for the greater Seattle area soon. It's similar in concept to 37Signal's Basecamp, but adds more services. It's a nice package. I especially (though only conceptually) like the support for easily creating online stores, and I think they could take e-commerce to a new level for SMB (small and medium businesses) by integrating an online store with services such as Google Checkout, Google Base, Paypal, eBay, Amazon, etc. Personally I already use the sort of services they provide (email, calendaring, auctions, photo sharing, etc.) from other sources, and I'd rather go with best-of-breed of each than go with a new aggregator. It's actually very painful to switch providers, so for anyone to outdo Flickr, for example, I think they'd need to thoroughly integrate with Flickr, so that there is no effort lost on the user's part if they make a switch. My guess is that Google will become the aggregator of choice of these types of services in the fairly near future. Their CEO, Dan Wyant, and their technical team are very approachable and would love you hear more feedback, I'm sure, if you try out the service. It would be nice to have a mechanism, e.g. triggered through a global password, that doesn't interfere with a computer's operation, e.g. during a video chat, but prevents kids from deleting email or interfering with the operation of the chat. Chat programs would definitely benefit from it, but it would perhaps be useful for other apps as well, such as music and video players. Perhaps I should explain, for those of you who haven't tried to use a laptop computer around a 9-12-month-old, that they like to explore just about everything, and that pressing keys, climbing all over computers, sitting on them, dropping objects on them, etc., are wonderful adventures. Unfortunately, computer designers haven't really considered this in their product designs. Otherwise, they would not have placed the on-off button and the delete keys at the top right corner of certain laptops, since the top left and right corners of the laptop are the most frequented parts for a kid trying to walk holding on to the sofa next to you, for example. Thank some user interface genius for Undo! "The researchers found that brainstems from babies affected by SIDS contained more nerve cells that make and use serotonin than the brainstems of the other infants. But there were fewer serotonin receptors in SIDS babies' brains, meaning they could not process the brain chemical as they should."